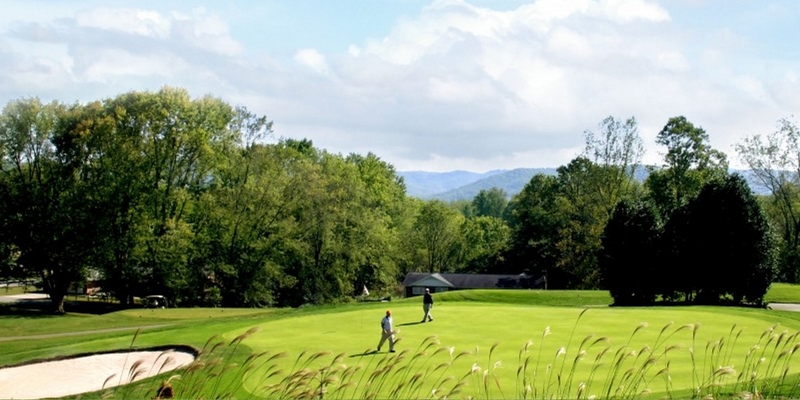 Rated one of the best golf resorts in North Carolina, Etowah Valley offers classic mountain golf at its finest. Our three distinct nine hole courses offer a great variety to golfers of all skill levels. 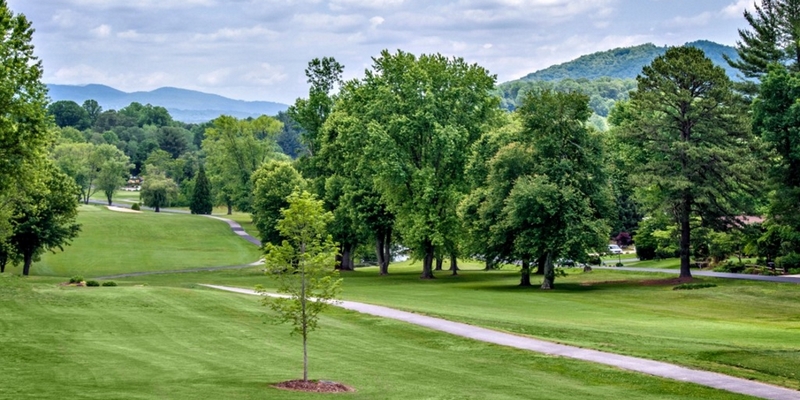 Between wide, forgiving fairways with moderate elevation changes, to tight and technical dog-legs that wrap-around a large lake, Etowah Valley has enough variety for all golfers to enjoy! We also have a driving range, two practice putting greens, and many on-site golf pros for people looking to brush up their golf skills with a quick lesson before hitting the links! Located directly on-site, our 65 lodge rooms offer modern amenities in a serene environment, surrounded by lush vegetation from April - Mid-August, and breath-taking Autumn leaves from late-August-mid-November. All rooms have been recently renovated, with either two queen beds or one king in all rooms. 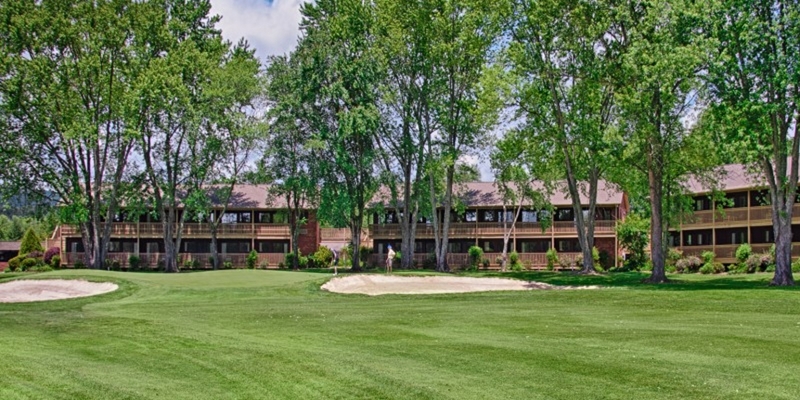 Additionally, all of our units have a large balcony overlooking our golf course, a great place to start your day or wind down in the evening. Our two on-site cottages also offer fantastic views of our course, and can be great gathering areas for larger groups. Zeke's, our on-site restaurant/bar, specializes in fresh, locally sourced food, with menu items ranging from salmon patties, to chicken tenders, to a prime rib special on Friday nights! Our newly renovated bar area always has a variety of bottled and draft beers to choose from, as well as an extensive wine list and cocktail menu. Guests frequently enjoy the great views and live music of our outdoor patio, which is located directly outside of our restaurant/bar area. From Asheville: take exit 40 onto Hwy 280. Go 9.6 miles, then left onto Brickyard rd. Golf Course is 2.4 miles after the turn. From Greenville, S.C: I - 26 to exit 49B onto Hwy 64 West. Go 7.5 miles, crossing over set of railroad tracks, go another 3 miles, crossing over 2nd set of railroad tracks, turn right onto Brickyard Road. (2nd road past tracks). Signage visible from Hwy 64 when close. Contact Etowah Valley Golf & Resort at 828-891-7022 ext 1 for more information and details on holding a golf outing at the course. We have 65 Lodge Rooms available, with most rooms having two queen beds. All hotel rooms have a balcony overlooking our golf course. 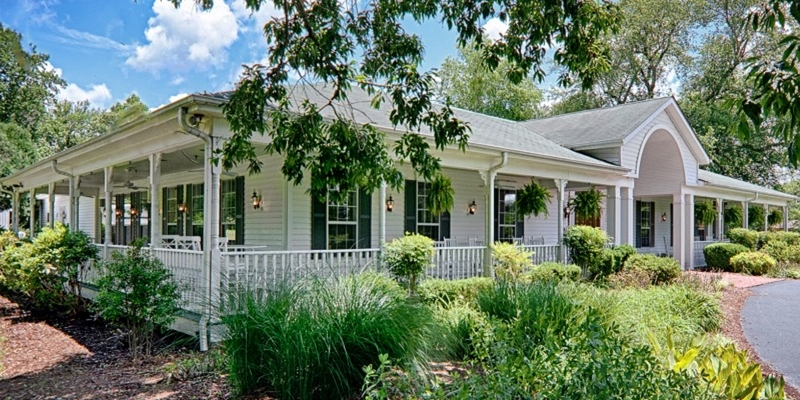 Additionally, Etowah Valley has two separate cottages on property available for rental. Our Lakeview Cottage is a three bedroom, two bathroom house with a large "party" room great for events or watching the game on our 80" High-Def TV. 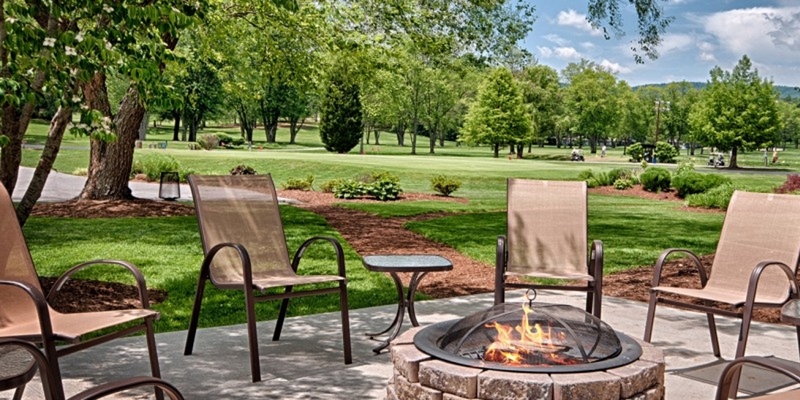 Lakeview also has a new large outdoor fireplace area, perfect for a relaxing evening with your golf buddies! Our Overlook Cottage is a four bedroom, two bathroom house featuring a wrap-around porch with rocking chairs "Overlooking" our North nine. Guests frequently enjoy unwinding at the end of the day with the serene view offered by this house. Zeke's Greenside Tavern is open daily from 11 A.M. - 9 P.M. (winter hours differ slightly). 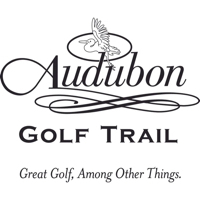 Our menu features local favorites, delicious full entrees, or quick grab and go food for the golfer on the turn. Live music is featured every Thursday and Saturday night on our outdoor patio, with unique nightly specials available as well. Our recently renovated bar area features 12 rotating taps, and an additional 25 bottled beers to choose from. Reservations are recommended for groups of 6 or more. Chelsea's Dining and Event Center is open daily for our breakfast buffet for all lodge guests. The breakfast buffet is included in all lodging rates and features bacon, eggs, biscuits, country potatoes, pancakes, and more! Chelsea's also has three separate dining halls that can be utilized for dinner for our golf groups in the evening. These would include buffet as well as plated options. This profile was last updated on 02/05/2019 and has been viewed 8,032 times.